We are grateful to Nicola King SLT, who describes how she and colleagues use Talking Mats not only to gain feedback from parents about the therapy process, but also about the parent’s understanding of the child’s diagnosis and its impact. The options to start the discussion are included in the mind map below. Click on image to enlarge. Nicola commented –‘These were huge issues and each response gave me a chance to explore what she was thinking and meaning. For the first time this mum offered her fears about ASD and ADHD. She enjoyed the Talking Mats process and after the interaction agreed for the first time to an onward referral which ensured support was in place for her son starting school. This entry was posted in Blog, Children and young people, Communication difficulties, GIRFEC, Participation, Personalisation, Talking Mats principles and tagged Children, Communication difficulties, GIRFEC, Participation, Personalisation, Talking Mats, Young people on January 16, 2015 by Joan Murphy. 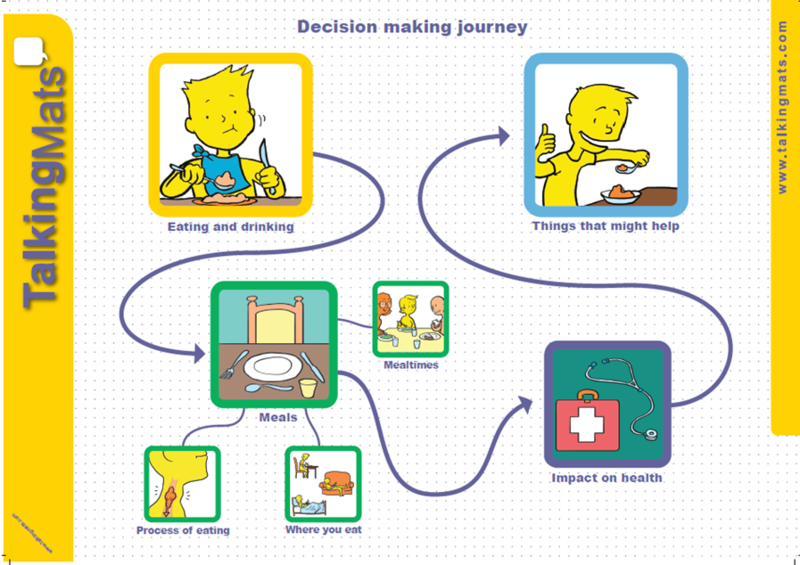 The Consulting Children and young people resource allows you to reorganise the symbol sets to reflect on each of the specific well being Indicators. If we take the example of safety, we can make the concept more accessible to the child by providing concrete examples. This may include: asking for help if needed, feeling listened to, as well as, safety in specific settings for example at home; in school; with friends or using social media. The CCYP resource helps the interviewer to think about the child’s age and stage of development and uses examples that are meaningful. The visual framework means that their is a clear record of the shared understanding between the child and the interviewer of the concept of safety. 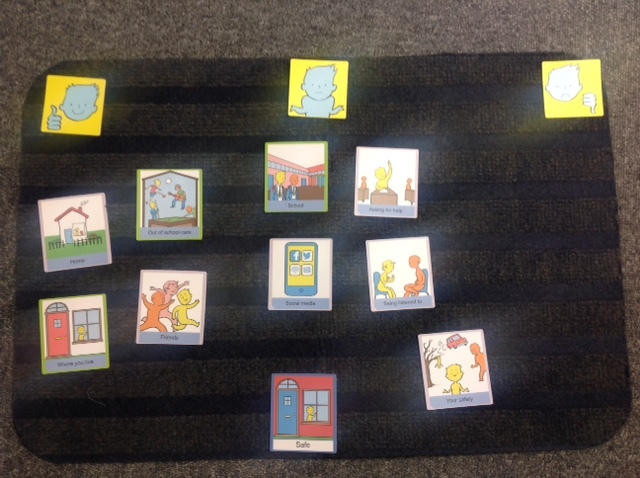 We are planning to run specialist sessions on using Talking Mats with the SHANARRI indicators in order to ensure that the child’s view is at the heart of the planning process. If you are interested please let us know what would work best for you. Email us at info@talking mats and tell us if you would prefer a Saturday session, a Twilight session or a half day session and state your preference for morning or afternoon. This entry was posted in Blog, Children and young people, Event, GIRFEC, Participation, Personalisation and tagged Children, GIRFEC on January 13, 2015 by Margo Mackay.